A lot of folks are calling the Renegade the Baby Jeep, and there’s some truth to that because it’s the smallest Jeep and solidly puts the brand into the growing small crossover/sport-ute segment. Renegade rides on a short 101.2-inch wheelbase and shares a platform with parent company Fiat’s 500X, its new all-wheel-drive version of the tiny 500. This Jeep is made in Melfi, Italy, along with Fiats. But make no mistake, you still get the full square-on Jeep look with flat bars in the grille and an ability to go off road. So it’s as Jeepy as other Jeeps and even offers a Trailhawk model that upgrades its off-roading capabilities. For instance, the tested Limited 4×4 has 7.9 inches of ground clearance whereas the Trailhawk has 8.7 inches of clearance. Yet mostly this is a small Jeep for folks who like the look, but prefer decent gas mileage, a lower price tag and the utility of a small sport-utility or crossover. There’s some step-up when crawling in, but this isn’t a major stretch as in some utes. This is more car than truck. 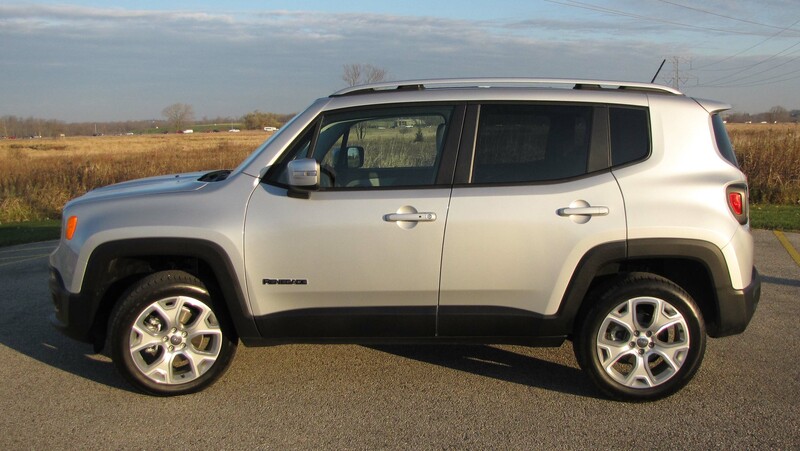 Like the Fiat 500, the Renegade offers a variety of engine choices and transmissions and in essence fills the price gap from $20 grand to $30 grand. 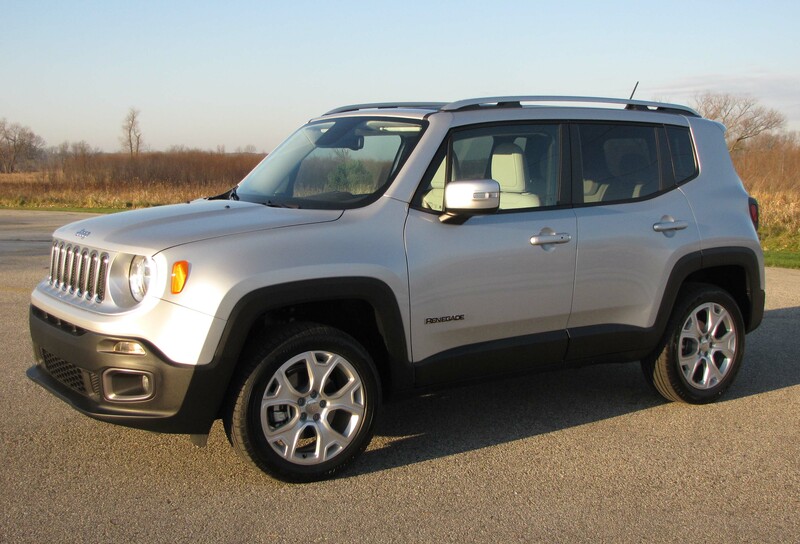 The silver test Renegade pushed the upper limits at $31,120 due to the addition of optional equipment. But the base Sport model starts at $18,990 in 2-wheel-drive mode and with a 1.4-liter Multi-Air (turbo) I4 boasting 160 horsepower. Moving to AWD raises the base price to $20,990, still attractive and in the ballpark for first-time and younger buyers. Related Video: Hop in and take a ride with Mark. The Limited lists at $26,795 with a $995 destination charge. 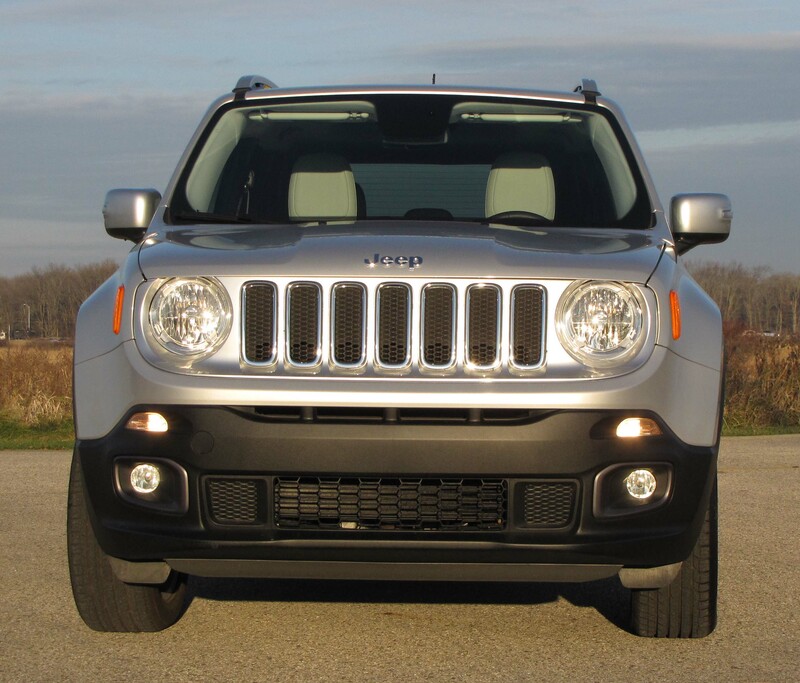 There’s a Latitude model between them and the Trailhawk tops the line with a list price of $26,990.If you love Jeeps, you’ll likely love the Renegade. Its pluses include the ability to go off-road. Its AWD system can be left on automatic or shifted into one of several modes, for mud and snow. I took this one into some mild mud and high grass and it handled the sloppy conditions just fine. I was a little wary of going into deep ruts that I thought might bottom out the Renegade, but then anyone buying it knows this is not a Wrangler. The Limited also comes with the more powerful 2.4-liter Multi-Air I4 that creates 184 horsepower and 177 ft.-lbs. of torque. Under normal acceleration it’s OK, but can feel a bit doggy in town. Cram the gas pedal down hard and it’ll kick up a little oomph to get to highway speeds relatively quickly. But that also stimulates more engine noise. In fact, the engine is groan prone when cold. Resting at stoplights there was some vibration and a lot of engine growl until the MultiAir warmed up on a couple 30-degree mornings. That only took a couple miles of driving though. The 9-speed automatic transmission, which you might think would provide smooth seamless shifts with all those gears, is jerky, not smooth. This is especially prevalent when the Jeep is cold. Shifts as I pulled from my drive were more like lurches. A couple riders asked if there were anything wrong with the Jeep as we pulled from a parking lot, the shifts are extremely noticeable. Ride isn’t as tough as in a Wrangler, thankfully. The Jeep rides well on the highway, but becomes bouncy on rough city streets. Again, this is a Jeep so you expect some bounce and if that’s what butters your bread then this will be a plus, not a minus. 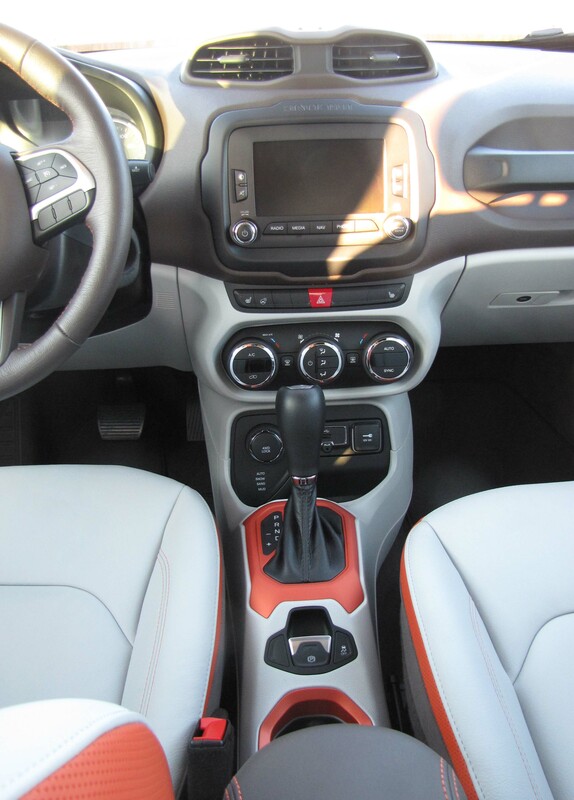 Looking inside you’ll find a fresh youthful interior that somewhat mimics the Kia Soul in cuteness and fun factor. I mean there are flames on the tachometer where normally there’s the redline. The test vehicle featured a brown over beige interior with the mix of colors on the doors and dash and beige seats along with copper to orange air vents and speaker faces in the doors, plus that same colorful trim by the cup holders and console-mounted shifter. Even the brown leather steering wheel had orange stitching. It’s a lively look and got a lot of comments from passengers. Renegade’s hard seats also garnered attention from passengers, even one that’s a Jeep devotee. Seat bottoms are relatively flat and hard while the seat backs are modestly contoured. Limited seats are powered too, but are manual on base models. The Limited includes two-level heated seats and a heated steering wheel, something all Midwest cars and trucks should be offering by now, so a plus for the baby Jeep. Renegade’s dash is clean and attractive. There’s a digital readout between the tach and speedometer, a tilt/telescope steering wheel with trip computer, phone and cruise control buttons on the hub. 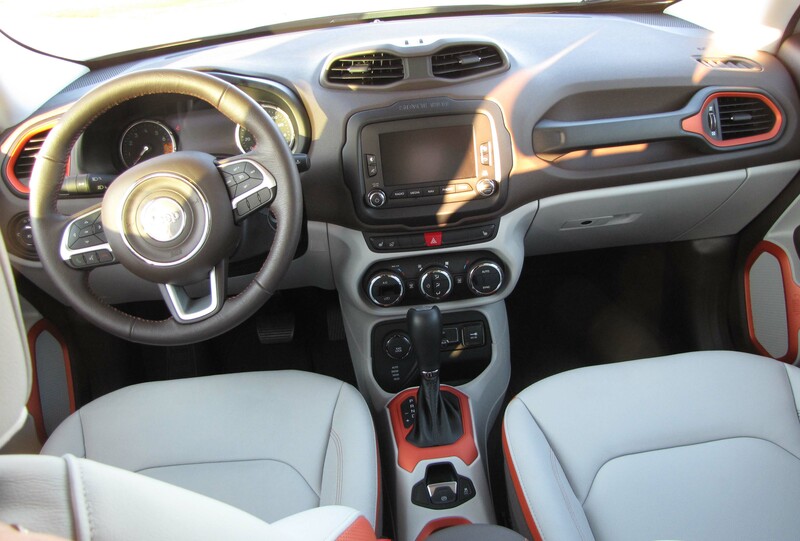 Three big knobs adjust the climate controls and are dual controls, so driver and passenger can both be comfortable. Start is by push button, a $295 option. There’s a grab handle on the dash for the passenger and the radio/nav screen is small, but easy to use. Overhead is a feature most Jeep fans will find exciting, the My Sky power retractable sunroof that also can be removed and stored under the hatch. This is a $1,395 option. Jeep also adds a second removable sunroof over the rear seat. The panels are not heavy and one person can handle removal, but putting them back is best handled by two folks to make sure everything lines up. It’s a clever feature that certainly drives home that you’re driving a Jeep. As for interior annoyances, well there’s a fair amount of road noise from the tires and some transmission whine from the AWD system. Again, this isn’t as severe as in a Wrangler, so may only bother a sensitive driver. The Renegade’s A-pillars are huge too, creating a bit of a blind spot. 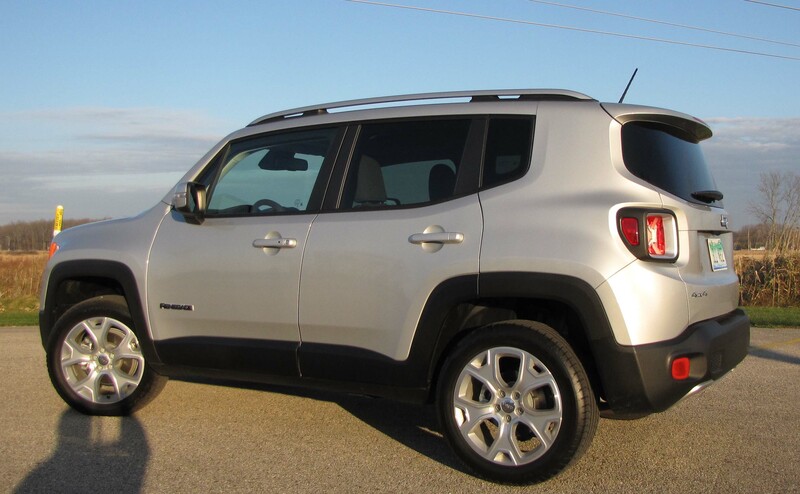 Rear seat room is good, so you can load four adults in the Renegade, plus some cargo in back. There’s a pouch on the cargo floor that will accommodate those roof panels, but the hatch is not powered and is a little tricky to open as the release is lower than you might expect on the tailgate. Pressing the wrong soft button there also locks everything instead of releasing the hatch. Did that a couple times! The test Jeep added fancier 16-inch polished aluminum wheels, visually worth it at $395, plus a $1,245 package that added a navigation system along with satellite radio with 6.5-inch touchscreen and traffic and travel links, HD radio and Uconnect telematics system. I could live without that, which would bring the price below $30 grand. Gas mileage is reasonable too. The EPA rates this unit at 21 mpg city and 29 mpg highway. I got 23.6 mpg in about 60% highway driving. As with many value-minded entry-level crossovers, the value is at the lower end of the lineup before you add too many options. AWD lovers and folks wanting a low-cost Jeep experience can find it with Renegade and still stay below $26 grand or so, with careful trim level and option selection. Hits: Jeep look, AWD and off-road settings, decent handling, attractive sporty interior, heated seats and wheel, dual removable sunroofs, one will also power back. Misses: Big A-pillar blind spot, bouncy ride, jerky transmission, growly engine when cold, hard seats and road noise from tires.